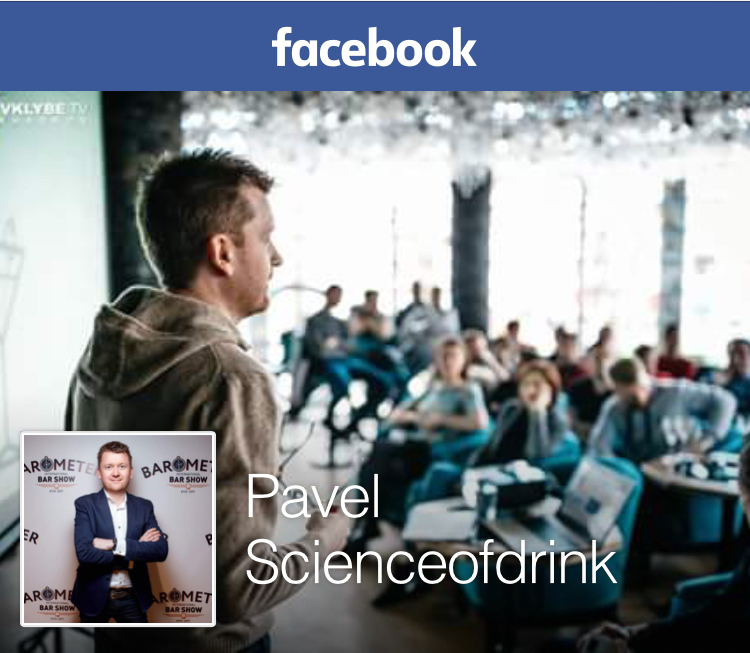 Posted on November 21, 2014 July 23, 2017 by Pavel Y.
I would like to make the point that classic or vintage cocktail sources do not always satisfy my imbibing thirst because – it must be admitted – many great cocktail combinations remain beyond them. There are many reasons for that. Certainly, barmen of the old days used only the liquors that they had in stock, and the knowledge that they were able to acquire. Therefore, the limited availability of imported beverages, low level of market integration (and, probably, relatively narrow and hard-to-find information sources) resulted in the limited number of approved combinations created on either side of the Atlantic. These combinations are, undoubtedly, exceptional, but some of those omitted seem not in any way worse. 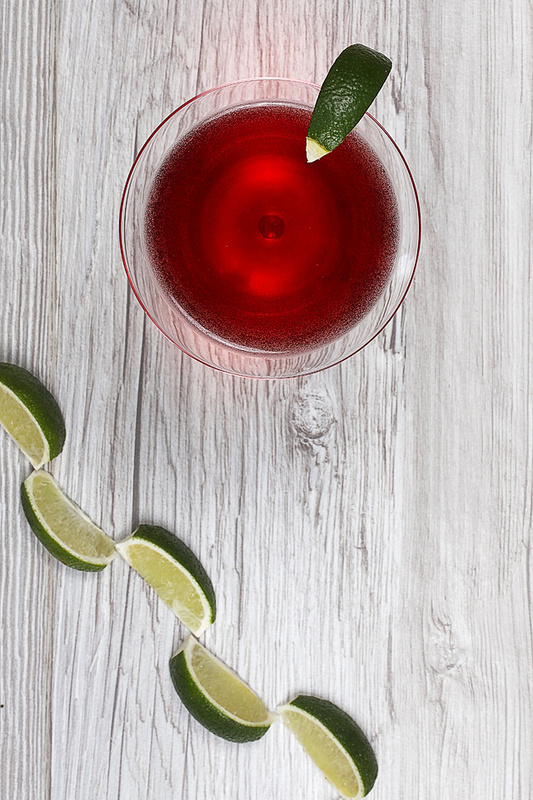 One of the best examples is mixing rum (especially dark) and Campari. 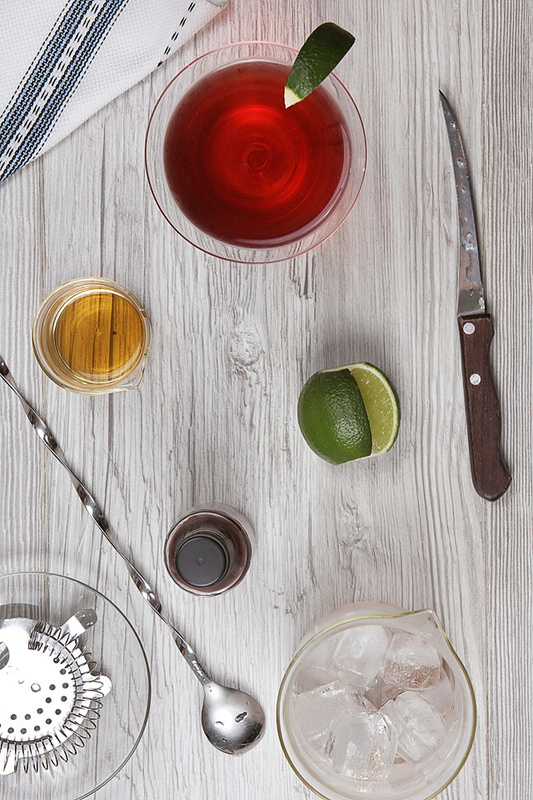 There are some truly classic compositions with Campari and gin (famous Negroni Cocktail), and Campari and whiskey (Boulevardier). They are both excellent choices, but the combination of Campari with aged rum, although very interesting, is relatively unknown. Fortunately, we live in the days of globalization, total market integration, and perfect information availability. Thus the question of untested cocktail combinations will be solved in the nearest future ;) And it is specifically we, the cocktailian bloggers, who will play a big role in sifting out cinders from ashes and turning them into future classics (certainly, if we don’t shy away from that) 8) So, let’s go! The Crimson Slippers Cocktail arrived in my GoogleReader [R.I.P., bro. I am still miss you] account on Nov. 10, 2010 [from Doug Ford], and was noticed straightway, not least because rum being my favorite base spirit at the time. Plus, it was a very interesting combination of Campari and Cointreau (they nicely work together – for example, in the Lucien Gaudin Cocktail). All of this promised a lot of enjoyment… However, I checked the history, and lost my appetite. Damn snoberry didn’t let me try the thing I wanted :) What a shame! 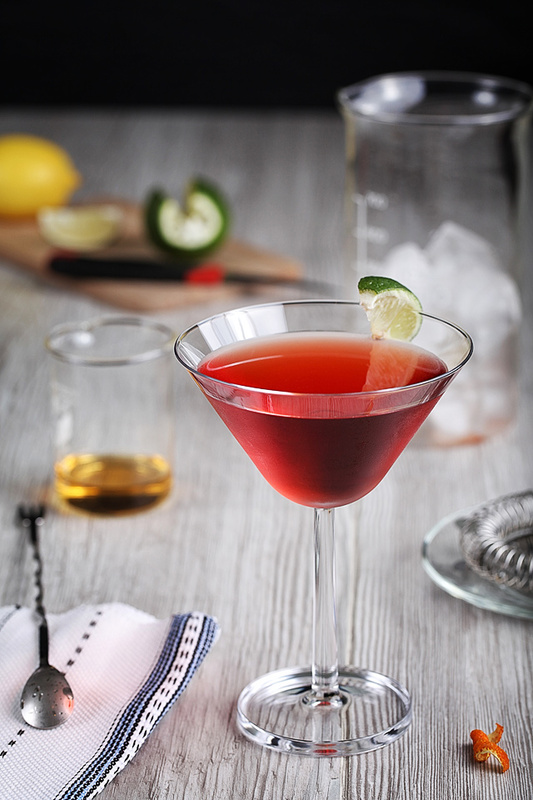 Let me explain: the Crimson Slippers Cocktail was created by a freelancer food-writer A.J. Rathbun. He came up with it in the hot August of 2008 and posted the recipe on his blog. After a while the recipe was published in his book Dark Spirits (2009). Thus it seemed insufficiently classic for me even though it was approved by several very respected blogs like the aforementioned Cold Glass and A Mountain of Crushed Ice. But let me look at this from the agathist point of view now :) – whatever happens happens for the best. I am really getting a lot of fun out of this libation here and now when I am so in need of such pleasure. Stir the ingredients in a mixing glass with a lot of ice. Strain into a cocktail glass and garnish with a lime wedge (OR [that I prefer] you may also rub the inside of the glass with the outside of the fresh cut lime wedge). A few words about the ingredients. The key one is Campari – a vivdly red, extremely bitter, herbal, palatable Italian aperitif. You may ask why I qualified Campari as the key ingrediend of the drink… You, certainly, could, but only if you have never tasted Campari :) It has such a distinctive and remarkable palate that it undoubtedly can’t be forgotten. And, by the way, I’m totally convinced that a bottle of Campari is essential in any cocktail bar. The next question is triple-sec liquor. Originally, A.J. used for his first sips a homemade liqueur, which was ‘not too sugary’ and ‘orange-y enough’; now he prescribes merely a triple-sec. Actually, I’m pretty sure that an excellent choice here is Cointreau, surely the best or, at any rate, one of the best triple secs ever. As for bitters, I strictly follow A.J.’s suggestion, – Peychaud’s, but if you haven’t got it, good orange bitters will probably work well, too. After superfluous (yeah, I should admit it) testing, I have made two main conclusions – a general and a particular one. Now, the particular conclusion: for me, the Cuban rum Havana Club 7 y.o. has become a favourite. This rum makes for a drink which corresponds completely to all my imaginings about a perfect play of a well-aged rum with bitter sweet Campari and Cointreau. Thank you for the links to Cold Glass, and for the kind words—and for the fine photos. It’s been some time since I’ve had a Crimson Slippers—I think I need to mix one up tonight. @Shamilboroda: на здоровье! Пропись действительно отличная. Нет, я, конечно, уже не тот вьюнош страстный, который пил все чисто из любопытства, сейчас я хорошо понимаю, что я собираюсь выпить то, что хочется на момент – крепкое и сладко-горькое. Но вот погружаться чуть ли не месяц в (и с ;) ) … Это было удивительно. Я люблю горько-сладкие коктейли — Negroni и Boulevardier, и Crimson Slippers стал настоящей находкой. God bless you, @scomorokh! Сначала я думал, что у меня нет лайма (подумаешь, он только для украшения) — полный восторг! Но черт меня дернул заглянуть в недра холодильника и лайм все-таки нашелся, и меня угораздило не просто украсить им коктейль, а выжать буквально пару капель. Отличный глубокий горький коктейль магическим образом превратился в нечто мягкое и бесхарактерное. Не повторяйте эту ошибку, пожалуйста. Я может быть кого-то удивлю своим вопросом, но как, черт возьми, коктейль получился такого прекрасного алого цвета на фотографиях??? Я использую те же ингредиенты и у меня он определенно заметно бледнее выходит. Льда использую более чем достаточно, поэтому разбавление водой отпадает однозначно. Даже с учетом использования темного рома, концентрация Campari недостаточна для получения такого насыщенного цвета.